Click Here for our Wholesale Store Bulk Case of 24. Remove Swirl, Scratches, Oxidation, Haze, Holograms & MORE! Meguiar's Soft Buff DA 5” Foam Pad Mix & Match 12 Pack is a great way to stock up on your Meguiar's Soft Buff DA 5” Foam Pads. Choose the pads you use the most and only buy what you need! 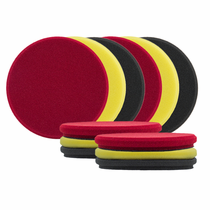 Select ANY TWELVE Meguiar’s 5” Foam Cutting, Polishing or Finishing Pads! Meguiar's Soft Buff DA 5” Foam Cutting Pad: Removal of MODERATE scratches, paint defects, swirl and oxidation. 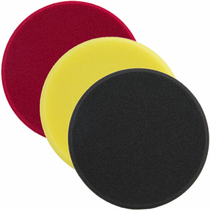 Meguiar's Soft Buff DA 5” Foam Polishing Pad: Removal of MINOR defects, minor swirl and very light scratch removal. Meguiar's Soft Buff DA 5” Foam Finishing Pad: Application of WAX, SEALANT and GLAZE. Meguiar's Soft Buff DA 5” Foam Pad low-profile foam of the were engineered to glide over flat contoured and flat paint surfaces. Meguiar's Soft Buff DA 5” Foam Pads will increase efficiency, reduce polish, wax, sealant and glaze consumption which will save you time and money. 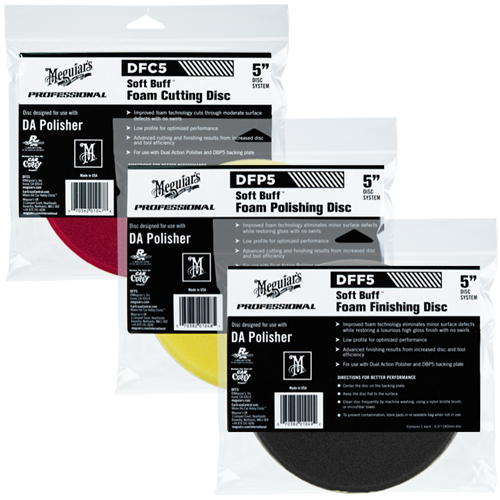 Meguiar's Soft Buff DA 5” Foam Pad RECOMMENDATIONS: Center Meguiar's Soft Buff DA 5” Foam Pad onto your Meguiar's 5” Dual Action Backing Plate on your DA polisher. Choose your polish, wax, paint sealant or glaze and be sure to keep pad flat on the surface during the polishing process. Meguiar's Soft Buff DA 5” Foam Pad CARE: Clean Meguiar's Soft Buff DA 5” Foam Pads during use with a nylon bristle pad cleaning brush. After use or when pads become dirty, hand or machine wash remove polish, wax, paint sealant and glaze residue. To prevent contamination store in original resealable plastic bag once thoroughly dry.